SABRE is rising from the couch, PISTOL still leveled at PAYNE. PAYNE’S nice-guy act is evaporating, the smile gone. 1. SABRE:	Drop it, sir, I shall not warn you again. PAYNE drops his HAT and PISTOL. 2. 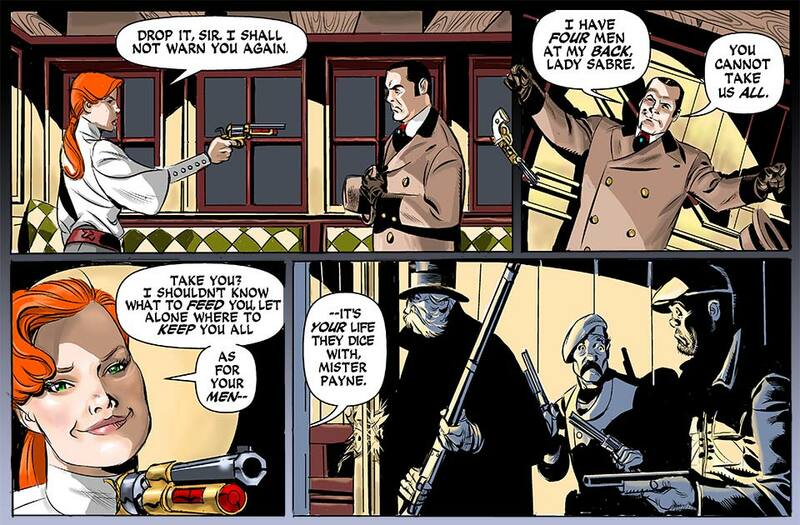 PAYNE:	I have four men at my back, Lady Sabre. 3. PAYNE:	You cannot take us all. SABRE smiles. Hans said very much the same thing not terribly long ago. 4. SABRE:	Take you? I shouldn’t know what to feed you, let alone where to keep you all. Outside the cabin, CALLOW, BURLEY, BARCLAY, and BEAUFORT (geez… lot of ‘B’ names, guys. Next time we do a poll to name characters, mix it up some more, okay?) are all exchanging looks. 6. SABRE/inside:	…it’s your life they dice with, Mister Payne.